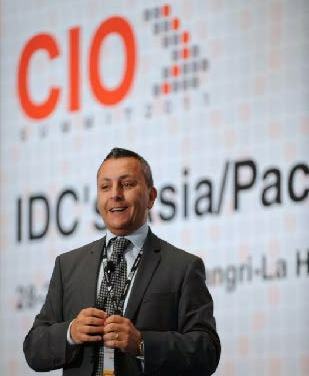 This blog post is based on my talk at the annual “IDC Asia/Pacific CIO Summit” held last July 28, 2011 in Singapore. The world of enterprise IT is going through lot of changes right now. One of the most important trends that’s causing these changes is consumerization. Now, what is consumerization? Simply put, it’s the trend wherein employees use their own personal IT devices for work. The most obvious consumerization devices are smartphones. More and more smartphones are being sold to consumers today. In fact, 92 million computers were sold in the last quarter of 2010 but more than 100 million smartphones were sold within the same time frame. These devices are ending up in the hands of tech-savvy users who have never known a world without the Internet… or a world without immediate connectivity and access. Businesses are going to have to make some real adjustments to lure this new wave of talents and that’s going to require offering them more choices than traditional, standard-issue office laptops. However, consumerization is about so much more than just smartphones. There are also so many online services that people are using for work. These can range from social networking sites like Facebook and Twitter to storage services like Dropbox and YouSendIt to voice over IP services like Skype. Skype is a perfect example of the “bring your own IT” concept, as it allows employees to save on roaming fees. Instead, they just need to spend on “premium” Skype subscriptions, which only currently costs about US$20 per month. Consumer IT devices are becoming relatively cheaper. These are also becoming easy to use. Internet connectivity is pervasive, thanks to 3G and Wi-Fi hot spots. So much content is now available online via apps and social media. The end result? A sort of civil war now exists between IT administrators and users. Back in the good old days, IT departments were responsible for evaluating, procuring, provisioning, maintaining, and supporting all of an enterprise’s IT devices. Things are different now. Today, overwhelmed by consumerization, IT administrators are struggling to enforce policies and standards and to maintain visibility and control. However, trying to keep consumerization out is a losing struggle. Enterprises and their IT administrators must keep up or be left behind. 2011 finds IT in a very different place than just a few years ago so it’s critical that we quickly adapt. We should embrace consumerization but in a way that makes good business sense. Now, consumerization has its own specific challenges. Security is one, as you’re letting company data go onto devices and services that you don’t always know or trust. Another is cost, as businesses get discounts from group purchases. Single users don’t. The third problem is device management. IT administrators are used to having their clients set up their way. Consumerization, however, brings in a multitude of platforms and setups. For a help desk, this can be very costly. In general, better-managed devices are safer devices. There are good reasons, however, to support consumerization. It allows you to keep up with the ever-increasing speed of our customers. It makes employees happier—employees today are very mobile, are very tech-savvy, and can balance their work and their daily lives. If you allow and support what they will, in all likelihood, end up doing anyway, you will end up with more productive and happier employees. That, in turn, is likely to end up leading to happier customers. What we recommend is that you embrace consumerization. It can’t be stopped and it doesn’t make sense to try. What you can do is make sure its full business potential is unlocked. Step 1: Have a plan. Take a strategic approach. IT departments cannot do this in a vacuum. Engage your line of business (LOB) owners (e.g., marketing, sales, HR, product development) and involve your early adopters, ask them what they use, what they like, and what they find most useful to support their work. Pull from their consumer experience rather than push your IT perspective toward them. Step 2: Say yes… but not to everything… and not to everyone. Develop a set of policies that clearly define which technologies are fully supported versus those that are merely tolerated or prohibited. Profile your internal users based on their role, LOB, and location. Then map technologies to user profiles and define service-level agreements (SLAs) for each intersection. Step 3: Put the right infrastructure in place. Deploy enterprise-grade tools and infrastructure that is specifically designed to secure and to manage consumer technologies in the enterprise. No single vendor can provide one solution that covers all functional requirements across all platforms. Several vendors from adjacent product segments offer overlapping core functionality. Find what works for your users and for your needs. In sum, consumerization is here, it’s here to stay for good. Businesses should embrace it so long as they have a plan to properly do so.